When, as a matter of course, the Editors of the magazine asked me during the holidays to Write the Foreword they did not know, indeed almost no one knew, that I was very likely to be leaving Queen's in a few weeks' time. When therefore, this appears in print I shall no longer be Acting Headmaster and I am particularly glad of the opportunity to turn the only Foreword it will be my privilege to write into a fond farewell message to Queen's. I have had a relatively unbroken connection with this great school since, in September 1936, I walked through the Hadfield St. gate of old Q.C. a lanky boy in flapping short pants. I have just had, as Acting Head, the privilege of admitting 111 new boys into Form 1 and another 26 or so into the Fifth Removes and Sixth. In the intervening twenty-seven years I have been a part of the body and life of Queen's and I understand its pulse, its strength, its spirit and its dignity. These are vital and great and must not be threatened or offended. If they are, then the Head's function becomes merely a biological one — registering pain and horror. If, on the other hand, they are safeguarded and nurtured in the best interests of the body and of the community of which the body is a part, then the Head's function becomes, as it should be, an educational one — thinking constructively for the improvement of the life of the body and its contribution to the community. In order that the latter-and proper-function may be realised certain principles must be generally accepted, the principles on which strength, and dignity rest. Strength in the form of high standards, greedily preserved and built higher; and dignity in the form of proper genuine courtesies (not the ostensible ones so common in B.G. today,) honesty, reliability of a man's word and a complete sense of fairplay. These are the character-building principles which, my young friends, should be in operation in all our dealings in the great work of education and in the challenging task of living honourably while coping with opposite and alarming points of view in other men. You will find the situation very difficult — it may even seem untenable if the operation of these principles is not observed both by you and by those with whom you have to deal. But we, the gentlemen of Queen's must, for our part, honour these principles wherever life may take us — these, and the supreme one, a belief in God, without which life is vexatious bunk. I leave with you and with all my colleagues of the staff my fervent wishes for the future good of our grand school. Standing: (L to R):Messrs D.J. Brotherson, G.S. Chang-Sang, G.P. Thompson, C.O. Perry, L.R. taylor, N.A. Robinson, B.A. Eyre, R.E. jackson, A.R. Smith, M.T. Lowe, C.V. Benjamin, E.R. Burrowes. Siting (L to R):Messrs C.I. Trotz, Chunilall, N.K. Robinson, C.E. Barker, M. deV. Delph, D. Hetram, C.A. Yanen, C.P. Yhap, R. Moor, Mrs. Persaud, R.M. Isaacs, B.S. Chin-a-pen, C.W. Yearwood, E.W. London. Absent:: Dr. S.R.R. Alsopp, Miss Dolphin, Miss Akai, Mr. A. Morgan, Mr. S.R. Insanally. Standing: (L to R): M. Bankay, D. Chung, A.M. gajraj, C.B.L. Morgan, O.D. Pollard, M.A.R. Rai, H.E. Dolphin, J.D. Alexander, M.E.M. davis, G.K. lewis, D.T. Roberts, R. Stephen, D.A. Ying, W.R.M. Frley, E.B. Douglas. 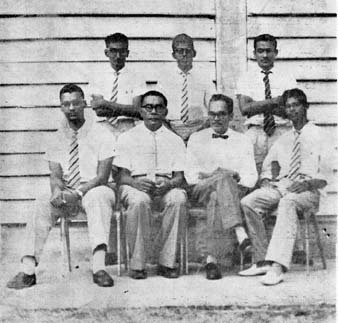 Sitting (L to R): C.V. Ho, K.L. Stull, C.O. Marshall (Head of School), M.R. Butchey, Dr. S.R.R. Alsopp, T.A. Sue-A-Quan, A.R. Morrison (Deputy Head of School), D.A.F. Ho-Chung-Qui, C.C. Hugh, C.B. Holder. Absent:: L. Warren, C.B. Singh. Needless to say the strike has had an effect on the academic side of school life which may well be reflected in the results of this years' 0' Level and A Level Exams. This is particularly true of science exams because science requires aid and supervision which were sadly missed, especially by Classical students doing science exams. The strike has, however, been both maturing and enriching in the sense that we have been given the unusual opportunity of seeing the birth pangs of a nation. Some businessmen may have found it enriching in a more literal sense. Such experience as bombings and the fire during one Ordinary Level exam matured some of us in another sense also— to the point of premature semesoence. In all fields this has been quite a successful year for the school, in spite of the fact that it ended in chaos. We will probably have to work very energetically next term because of the loss of time. I would suggest that in this rather unsettled atmosphere, students continue to show the discipline and restraint which they showed during the last few weeks of this school year. The time has come to ask ourselves just how powerless we are in the face of the rapid deterioration of race relations in this country. Obviously, toleration or better friendliness between individuals of different races can result in the rapid amelioration of the situation. Here at Queen's there are certain cliques or gangs which consist entirely of boys of the same race. I would suggest, that any boy of a particular race should make a conscious effort to hold friends of another group and to understand the ideas and religion of that group. The only true integration is intermarriage: but while we cannot control our affections we can certainly try to make friends. • We have a country of great potential but at the moment it is ill. As exceptionally well educated young Guianese we have it in our power to cure it. Let us not be accused of witholding our power or of becoming part of the "brain drain". We should resolve, as Lincoln said of the United States "That this nation undier God shall have a new birth of freedom and jthat Government of the people, by the people for the people shall not perish from the earth." Recently we heard that a magazine in the U.K. has included this school in a series on Famous schools of the world. This year 'Ebony' magazine paid several compliments to Queen's College but said that Q.C. was in Jamaica. Several issues later, a Jamaican wrote a letter saying that this was a mistake, but that the editor should try Barbados. The editor in a note, said that several readers had said it was in British Guinea. I have cited this incident to show that our school is famous even to people who have never heard of our country. We have a great heritage; let us be worthy of it. ADAMS (19 -1963: G.C.E. 0' Level 1960 — Secretary and President of Photographic Society. President of Tour Club, Secretary of Hockey. Treasurer of Lictor and Magazine; Sgt. in the Cadets. Hockey Team. DOLPHIN, H.E. 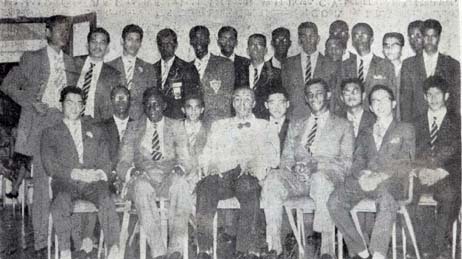 (19 -1963): G.C.E. '•0' Level 1961 and 1962. School Prefect. School Cricket Captain. School Cricket Colours. Represented school, scoring highest aggregate in Northcote Cup. Deputy Head of "H" House. DOUGLAS, E.B. ( ): School Prefect. Head of Moulder House. A consistent winner of Form prizes who has won four first prizes and two second prizes during his school Career. G.C.E. '0' Level 1961. FARLEY, W. R. M.: President of the Cercle Francais. President of the Christian Fellowship Society. School Prefect. Deputy Head of Cunningham House. Lower School Prize in 1959. Sports Editor of the Magazine. House Debater. 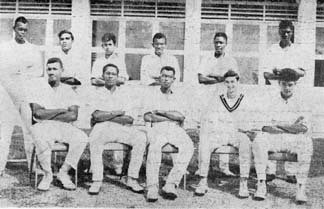 Wight and Rajah Cup teams. G.C.E. '0' level 1960 and 1961. HO, C. V. ( ): G.C.E. 'O' Level 1959 and 1960. School Prefect President of the Science Society. Company Sgt. Major in the Cadets. Secretary and Treasurer of the Bee Keeping Society. Vice Captain of Table-tennis in House. Represented School in hockey. Head of Pilgrim House. HOLDER, C. B. ( ): G.C.E. '0' Level 1959 and 1960. School Prefect; Captain of Hockey. President of the Bee Keeping Society. Treasurer of the Science Society. Sgt. in the Cadets and in School Shooting Team. House Captain of Football and Vice Captain of Athletics. MARSHALL, C.O. ( ): G.C.E. '0' Level 1959 and 1960. Head of School and Head of House 1962-1963. School Athletics Captain. President and Secretary of the Historical Society and the Literary and Debating Society. President of the Dramatic Society. Editor of the 'Lictor' 1960-1961. Editor of the Magazine 1961-1962. School Debater. Colours for Athletics. MORRISON, A. R. ( ). G.C.E. '0' Level 1959 and 1960. Deputy Head of School. Head of Nobbs House 1962-63. House Cricket Captain Represented school in Rajah, Wight, Case and Northcote Cup teams. STEPHEN, R. M. ( ): G.C.E. 'Q' Level 1960 and 1961. School Prefect. President of the Tour Club. Deputy Head of Pilgrim House, Vice Captain of Cricket. House Cricket Captain. SUE-A-QUAN, T. A. ( ): G.C.E. '0' Level 1960. School Prefect. Head of Woolley House. Secretary of Hockey. President of the Chess Club. House Captain of Football. A prominent member of the Male Voice Choir. YING, D.A. ( ); G.C.E. '0' Level 1959 and 1960. School Prefect Head of Cunningham- House. Vice-Captain of Table-Tennis. House Table-Tennis Captain. President of Christian Fellowship Society. Active member of the Cercle Francais. Farquharson, C. J. Farquharson, D. A.
Naraine, G. Nasir, Z. D. M. M. A.
Singh, L. Storey, M. E. H.
The Magazine Executive and the school congratulate the following Old Boys of Queen's College who have distinguished themselves in various ways during the past year. Mr. K. 0. E. Barrows on winning the Winston-James Prize for surgery. Mr. R. L. Clarke M.A. on being appointed Headmaster of Dominica High School. Mr. S. A. Hinds on winning a Demba Scholarship in Mechanical Engineering tenable at U.W.I. Dr. L. R. Kerry on gaining the MB. BS: degree. Mr: R.M.S. Khan (1951-1960) on gaining his B.A. 1st Class Hons. in Latin at Durham University. 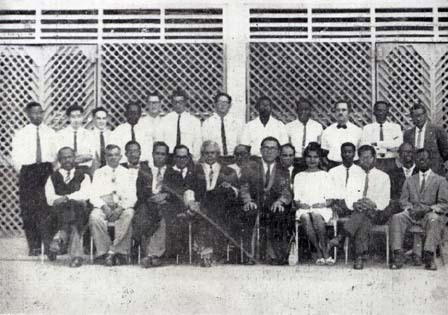 Mr. K. A. Nobrega (1952-1962) on gaining a Bookers Cadetship in April 1963. Mr. D. Ramharry (1949-1959) on gaining his B.Sc in Engineering at London University. Mr. W. A. Rodney (1953-1960) on gaining his B.A. 1st Class Hons. (Lond:) in History at U.W.I. Mr. G.F.B. Rohlehr (1953-1961) on winning the Alien Layne Prize for the best essay on some aspect of English Literature. Mr. G. A. S. Van Sertima (1937-1945) on being appointed an acting Puisne Judge. Dr. E. A. Sue-A-Quan on gaining his MB. BS. at Edinburgh University. Mr. E.A.C. Thomas on winning the Faculty Prize in Mathematics in 1962 and on gaining his B.A. 1st Class Hons. (Lond.) in Mathematics at U.W.I. .... and we congratulate all the successful candidates at the annual external examinations. Standing: (L to R): Rohlehr, H. Syed, M. Niamatali, O.E. Denbow, Walcott, L.O. Griffith. Sitting (L to R): A.R. Morrison, R.M. Stephens, H.H. Dolphin, R. Roopnarine, H. Ross. Sitting: (L to R): J.M. Thom, D.A. Chung, A.E. Fox, J.R. Went. 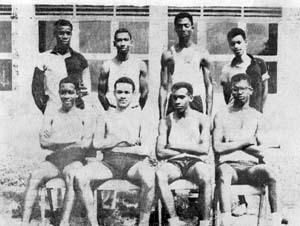 Standing (L to R): Pollard, Adams, D.T. Roberts, Joseph. Standing: (L to R):P.D. Fraser (Asst. Editor), B.A. Drepaul (Asst. Buss. Manager), and D.A. Chung (Sports Editor). Sitting (L to R): J.L. Robinson (Editor), Mr. C. Yhap (Business Supervisor), Mr. M. V. Delph (Literary Supervisor), & R.N. Jabour (Business Manager). 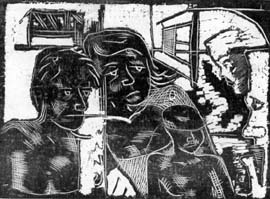 Wood engraving by Michael Cox, L6C.